A legless wage-mage, lately helping the Problem Children in their lower city war. Deceased. Kelly Rogers, a nurse. Rating 2. Wanted in connection with a museum heist. Carlos Bender, a janitor. Wanted in connection with a spaceport terrorist attack. Rating 1. Ronald R. Andes, an Ares network support tech. Rating 5. Lost his legs in a terrible parachuting accident. Male human of caucasian/asian mixed heritage, attended college and was a talented athlete until his accident, then spent a while in the hospital. Refused cyber-reconstruction, and took a long time to come to terms with the loss of his legs. He left Earth to avoid the pity of his former friends, classmates, and family. He spent nearly a decade on Mars researching the arcane arts, learning powerful magics and connecting to the astral plane. Meanwhile, he taught himself to walk with human looking prostheses, and to run swiftly on optimized coiled alloy legs. He is know 28, and though he continues his research into the arcane arts, he has gained enough skill and confidence to sell his services to those who can afford them. His eventual goal is to become powerful enough to be able to constantly levitate, avoiding the need for the prostheses. Perhaps the accident has made him whole? He has mostly done minor magic security work in the undercity, as well as some astral research for hire. He recently worked for the Black Shadows, doing some magic barrier maintenance at Long Pig’s mansion. Based on this, he was hired by the Problem Children to help a team gain access to the mansion, and raid the basement safe. While there, he helped rescue a legless captive, John Caruthers, who he has attempted to stay in touch with and befriend. He is currently traveling in the company of the team he helped break into the mansion. His talismonger, Madame Gavral, has engaged his services to track down a supply line problem, and he has in turn hired his recent companions to assist. 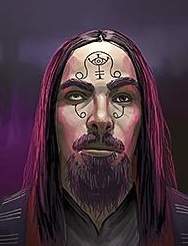 Having worked his way in good with Gavral, and her magic group, K recently became a level 1 initiate in the Hermetic Order of the Crimson Lands. Post=spaceport: He makes himself pleasantly attractive, but not intimidatingly so, and now has dark grey skin. Killed at Arlen Thompson’s house, after discovering his only friend butchered.